It's already time to set my April goal for A Lovely Year of Finishes. I've been careful not to make my goals too easy this year, and so far I'm three for three. It feels good to get things done. This month's goal is a big one with plenty of work and when finished it will be another UFO checked off the list. 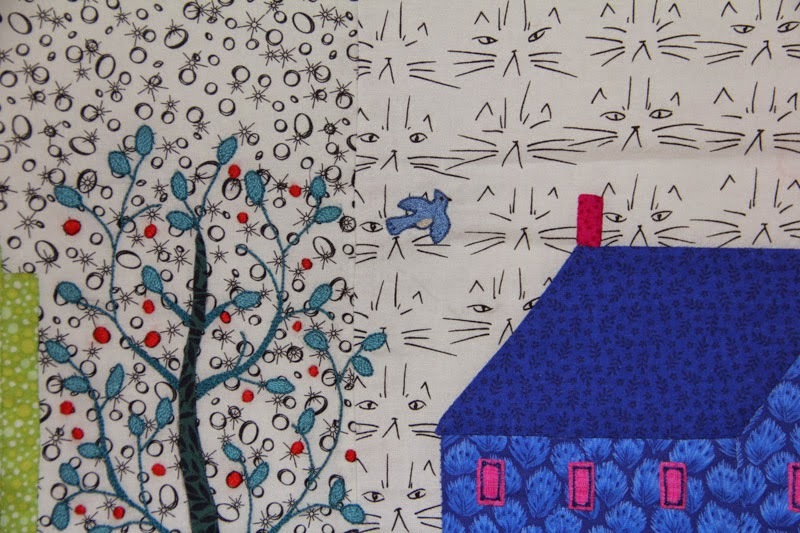 It's time to finally finish the Quilted Village! I just completed the center portion of the quilt and got all the houses attached. The center turned out to be quite a challenge because it was way too small. I ended up having to figure out how to add borders without ruining the look. I added flanges to some of the borders to make it more interesting, and now I think it's just perfect. This week my focus was to finish hand embroidering all the birds. Now it's ready to baste. My goal for April is to finish this quilt. I need to baste, quilt, and bind it. I'm linking up to the Goal Setting Party at Fiber of All Sorts. I will be goal #88. What an adorable quilt. It is just so sweet. I could use a lot of adjectives here. I can't wait to see it at the end of April! Great job! 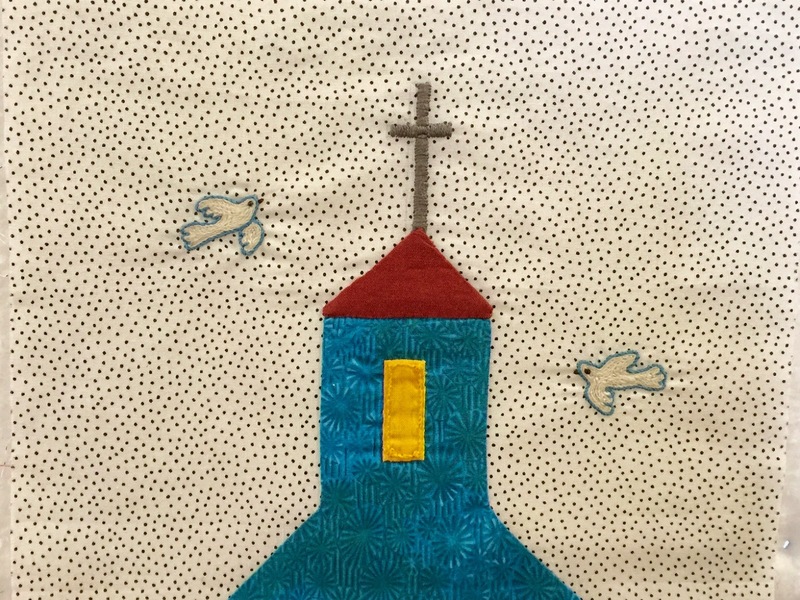 When I did this quilt my birdhouse was off-kilter. Love the colors you chose. I love that the skies are different, and there are birds in your town. Your town is so colorful, much better than what the pattern suggested. 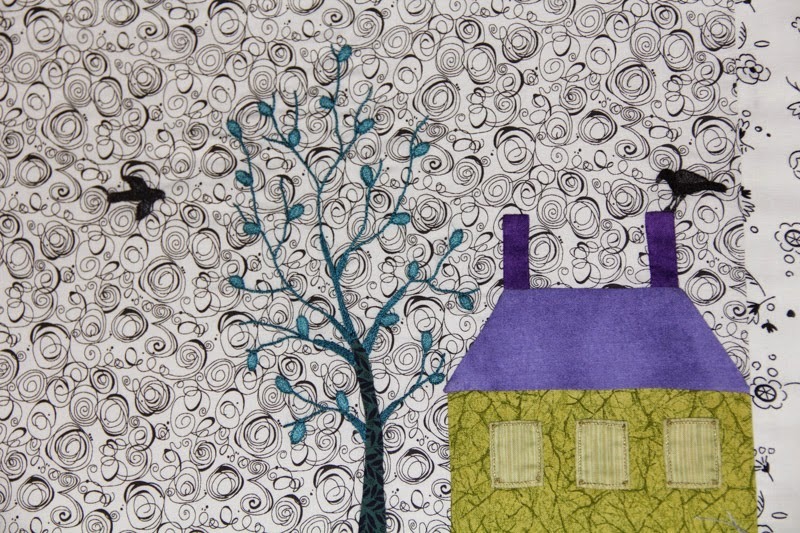 I would like to live there - in the Purple House, of course. It would make a perfect "Glory Bees" - Tea Room downstairs and eclectic shoppes upstairs. Of course, we would serve your favorite coffee(s) as well. Thank you for sharing your quilts, their progress and their stories. Sandy...you've done a great job on this one. 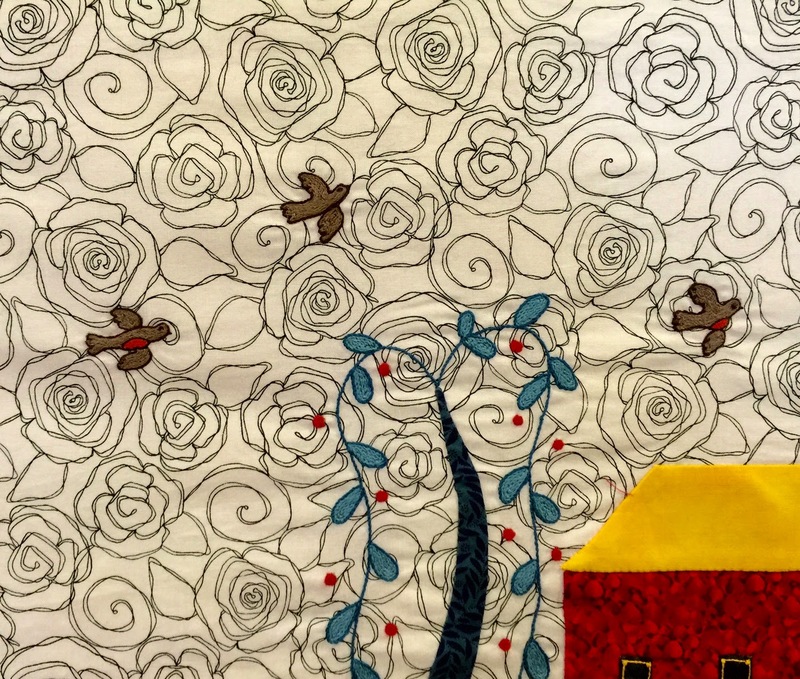 Are you machine or hand quilting it? I love how you fixed the size problem in the center. It's perfect. Love everything about this quilt. You have to bring this one to retreat. I hope you are keeping it for yourself this time around, too. What a fun town! When can I move in? Yes, I too hope this is a "Sandy" quilt. Excellent solution!!! 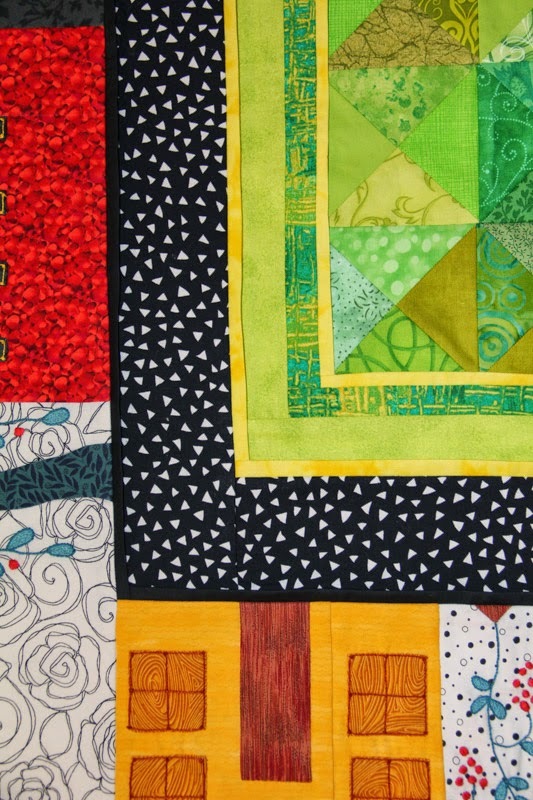 I too love everything about ths quilt...your color choices make for a happy, playful neighborhood! 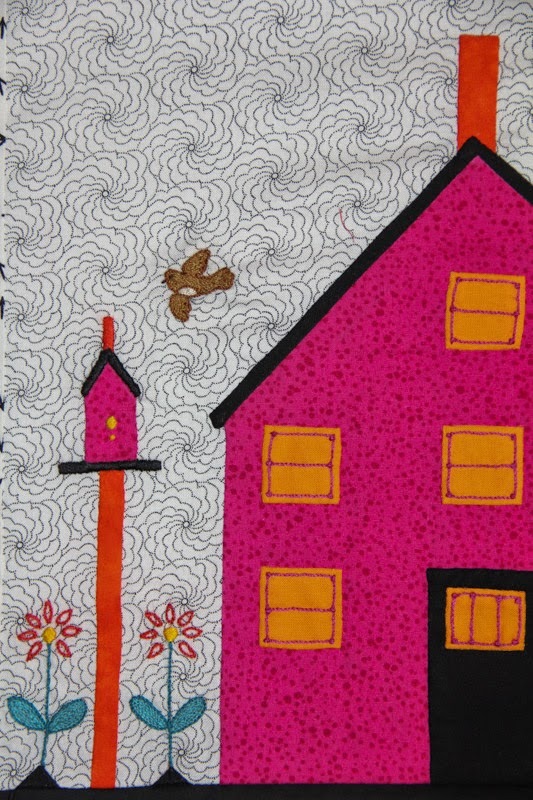 Your Quilted Villages is stunning. Just love your color choices! I think April is the perfect month for this one to get done too.